The Standard Model of particle physics successfully describes the interactions of all directly observed particles, including the Higgs Boson discovered in 2012 at the Large Hadron Collider. The Standard Model does not, however, explain the enormous hierarchy of observed mass scales, the imbalance between matter and anti-matter, the nature of dark matter and dark energy, and it does not describe gravitational interactions. Theories that develop a deeper understanding of physics beyond the Standard Model suggest many possible new signatures from high-energy proton-proton collisions at CERN's LHC. A clean and simple signature is provided by photon pair events, or “γγ”. New physics processes that could be observed with γγ events include an extended Higgs sector motivated by the need to explain the hierarchy of mass scales and also “gravitons” which are predicted by quantum mechanical descriptions of gravity. If a new particle is produced at the LHC which decays into photon pairs, it could be observed as a “bump” in the distribution of the mass of the di-photon system, mγγ, over the smooth distribution from background processes with two photons or with particles faking photons. This signature was key to the discovery of the Higgs boson with mass mγγ = mH ≈ 125 GeV or about 130x the mass of the proton. 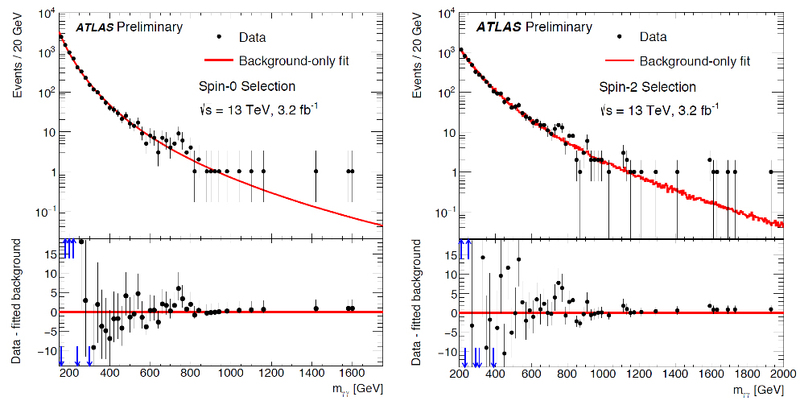 The ATLAS Collaboration uses two selections in this search, one optimised for Higgs-like particles that are expected to have a strong signal compared to background with both photons in the central region of the detector (the “spin-0” selection) and a second optimised for graviton-like particles (the “spin-2” selection) which often have at least one photon close to the LHC proton beam axis. The mγγ distribution for each selection using the full 2015 data-set with an LHC proton-proton collision centre-of-mass energy of 13 TeV is shown in Figure 1. A modest excess in each the spin-0 and spin-2 selection at mγγ ≈ 750 GeV, or nearly 800x the proton mass, is apparent. ATLAS carried out many cross-checks of the result, including carefully examining the properties of the photons, looking for signs of other activity in the events, and seeing if the events in the mγγ excess around 750 GeV have any features that differ from the events in the neighbouring mass regions. All cross-checks indicate that the events in the excess are clean photon pairs. The data taken previously at lower LHC energies in 2012 was also re-examined with two equivalent selections and under specific assumptions these results do not exclude the hypothesis of a signal. The best fit width of the bump in the data is about 45 GeV, and if we knew ahead of time that there might be a signal with a mass of 750 GeV and width 45 GeV (the “local” significance) the statistical significance would be 3.9σ for spin-0 selection and 3.6σ for the spin-2 selection. However, there was no indication in advance of any preferred mass or width, and the probability of seeing an excess of this magnitude anywhere in the distribution (the “global” significance) is about 2σ. The probability of pure background giving an excess of this size anywhere in the search is about two percent. ATLAS eagerly awaits the 2016 LHC data to further elucidate the nature of this excess.